Earlier this fall, dedicated volunteers from our Sweet Home Dollars for Scholars affiliate in western New York took the concept of “homecoming” to a whole new level: for a week, they made their high school’s football field their actual home. 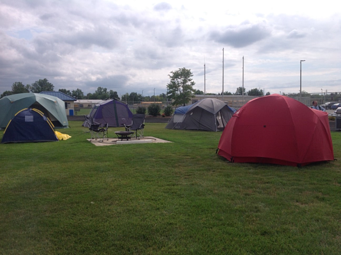 And their “tent city” involved more than camping out for football tickets. The “Campaign Campout” was the affiliate’s innovative idea to raise funds for the Dollars for Scholars Matching Grant Program, which helps to provide renewable scholarships for local students. Scholarship America announced the program last winter, to help our affiliates develop and implement renewable scholarships in their communities. The chance to offer renewable scholarships comes at an important time: higher education has never been more expensive, but attending college has never been more important. Renewable scholarships help counter student loan debt and encourage students to pursue their higher education, all the way to graduation. That’s where the Matching Grant Program comes in to help. Renewable scholarships are larger, more impactful awards to support students, but they also require long-term financial commitment. To help affiliates fund them, the Matching Grant Program offers $5,000 or $10,000 awards – amounts raised locally by affiliates who apply for the program, which are then matched by national resources from Scholarship America. In addition, the program comes with training, a needs assessment and customized one-on-one consultations to make the scholarships a reality. This past summer, 20 affiliates were selected based on grant program qualifications, selection criteria and availability of funds. Each had different ideas for how to most successfully raise money in their community. For Sweet Home Dollars for Scholars, one of the $5,000 recipients, their method of stepping up to the challenge was particularly unique: camping out on the high school’s football field. “What we would do” was part crazy, part ingenious idea: Don would pitch a tent on the Sweet Home High School football field for the entire week leading up to the school’s Homecoming game to raise awareness of student scholarships – a perfect time to capture the interest of students and staff alike. This year’s Homecoming game happened to land earlier in the school year, which helped buoy weather expectations in the Western New York town. Homecoming festivities would also coincide with a district-wide United Way campaign, where donor-designated dollars could be directed to Sweet Home Dollars for Scholars. As Mike Morrow, president of Sweet Home Dollars for Scholars noted, though, the application was submitted in the winter – likely when the football field was buried underneath snow. And, according to Don, the week began with a sunny, warm forecast, but ended with a lot of rain that fell upon “Tent City.” “A full week was a little taxing on my sleep, on my family and on my body!” laughed Don. Despite the elements, Campaign Campout did attract attention, and support came rolling in. The Amherst Bee previewed the campaign. Mr. Morrow joined Don on the field. So did the school district superintendent and other affiliate supporters. The high school’s principal even hosted a hot dog cookout, and other food contributions flowed in to keep the campers nourished. In total, Campaign Campout raised around $7,900 – a third more than the original $5,000 goal. It was a winning combination: the local community rallied behind the affiliate, and Scholarship America’s national match nearly doubles the campaign amount. Together, the funds will help ease the burden and cost of postsecondary education. Not to mention, the successful week ended with even more celebration: the football team walked away with a resounding Homecoming win.